Go to original pattern for design DROPS 184-9. 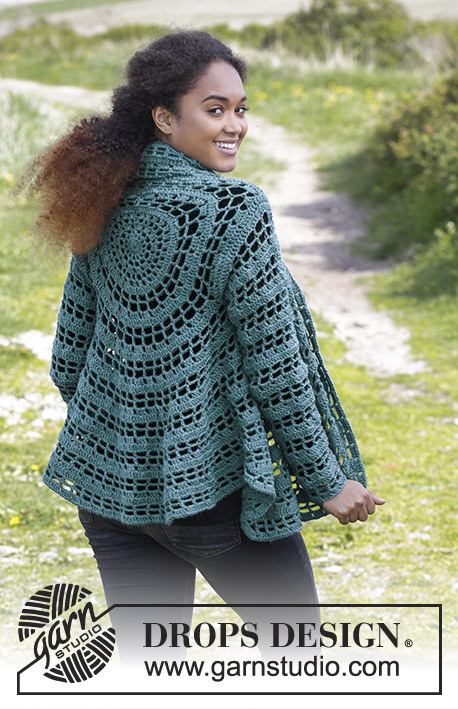 Crochet circle jacket with double crochets and chain-spaces. Sizes S - XXXL. The piece is worked in DROPS Lima. DROPS CROCHET HOOK SIZE 5 MM / H/8 – or the size needed to get 16 double crochets and 8 rows on 10 cm / 4'' in width and 10 cm / 4'' in height. 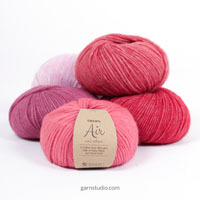 You can get the yarn to make this pattern from	46.80$. Read more. 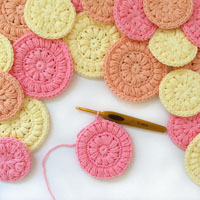 Every round of double crochets begins with 3 chain stitches and finishes with 1 slip stitch in the 3rd chain stitch at the beginning of the round (worked in addition to diagrams A.1 – A.5). To work out how to increase evenly, count the total number of stitches (e.g. 28 stitches) and divide by the number of increases to be made (e.g. 2) = 14. 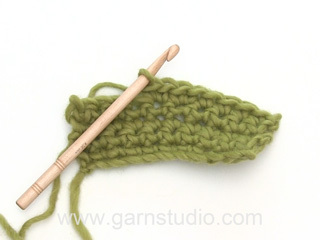 In this example, increase by working 2 double crochets in every 14th stitch. To work out how to decrease evenly, count the total number of stitches (e.g. 64 stitches) and divide by the number of decreases to be made (e.g. 4) = 16. In this example, work every 15th and 16th stitch together. Decrease 1 double crochet by crocheting 2 double crochets together as follows: work 1 double crochet, but wait with the last yarn over and pull through (= 2 loops on the hook), then work the next double crochet but when working the last pull-through, pull the strand through all 3 loops on the hook (= 1 double crochet decreased). The piece is worked in the round in a circle and armholes are worked on the circle. Then the sleeves are worked in the round and the front pieces are worked back and forth. Finally, you work a finishing edge around the whole circle and front pieces. The start of the round = mid back/neck. Work 6 chain stitches with hook size 5 mm / H/8 and Lima and form them into a ring with 1 slip stitch in the first chain stitch. Work A.1 a total of 13 repeats on the round - read CROCHET INFORMATION! REMEMBER THE CROCHET GAUGE! There are now 182 stitches on the round and the piece measures approx. 36 cm / 14 1/4'' in diameter. Work 1 double crochet in each double crochet/around each chain stitch over the first 28-28 stitches and increase 2-2 double crochets evenly – read INCREASE TIP (evenly spaced). Work 32-36 chain stitches, skip the next 32-36 stitches. Work 1 double crochet in each double crochet/around each chain stitch in the next 62-54 stitches and increase 9-9 double crochets evenly. Work 32-36 loose chain stitches and skip 32-36 stitches. Work 1 double crochet in each double crochet/around each chain stitch over the remaining 28-28 stitches and increase 2-2 double crochets evenly = 195-195 double crochets. Now work A.2 (= 13 repeats on the round), BUT over the 32-36 new chain stitches, replace the double crochet on round 2 in diagram A.2 with 1 single crochet around the chain-stitch row. On the round after you have worked the armholes, there are a total of 52-52 chain-spaces on the round and 9-10 chain-spaces and 8-9 single crochets around the 32-36 chain stitches for the armholes. When the whole of A.2 has been completed in height, there are 78 chain-spaces on the round. The piece measures approx. 63 cm / 24 3/4'' in diameter. Work 1 double crochet in each double crochet/around each chain stitch over the first 36 stitches and increase 2 double crochets evenly – read INCREASE TIP evenly spaced). Work 40 chain stitches, skip the next 40 stitches. Work 1 double crochet in each double crochet/around each chain stitch in the next 82 stitches and increase 9 double crochets evenly. Work 40 chain stitches and skip 40 stitches. Work 1 double crochet in each double crochet/around each chain stitch over the remaining 36 stitches and increase 2 double crochets evenly = 247 double crochets. 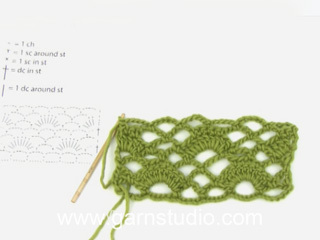 Continue with A.2, BUT over the 40 new chain stitches, replace the double crochet on the 5th round in diagram A.2 with 1 single crochet around the chain-stitch row. On the round after you have worked armholes, there are a total of 65 chain-spaces on the round and 11 chain-spaces and 10 single crochets around the 40 chain stitches for the armholes. When the whole of A.2 has been completed in height, there are 78 chain-spaces on the round. The piece measures approx. 63 cm / 24 3/4'' in diameter. Start on the 3rd round in the diagrams and work pattern as follows: Work * A.3, A.4 *, work from *-* a total of 13 times on the round. When A.4 has been completed in height, repeat the last 4 rounds in the diagram to finished length. When the round marked with a star in diagram A.3 has been completed, sizes S/M and L are finished. For size XXL/XXXL continue until the whole of diagram A.3 has been completed in height. There are now 117-117-130 chain-spaces on the round. The piece measures approx. 91-91-101 cm / 35 3/4"-35 3/4"-39 3/4'' in diameter. The sleeves are worked in the round. 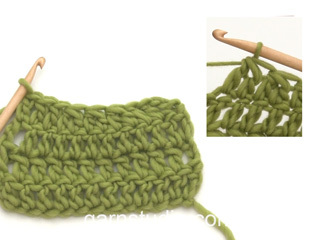 Start mid under the armhole and work 3 chain stitches (= 1 double crochet), work 64-72-80 double crochets evenly spaced in the double crochets/around the chain-spaces in the one armhole (= 32-36-40 double crochets along each side of the armhole). 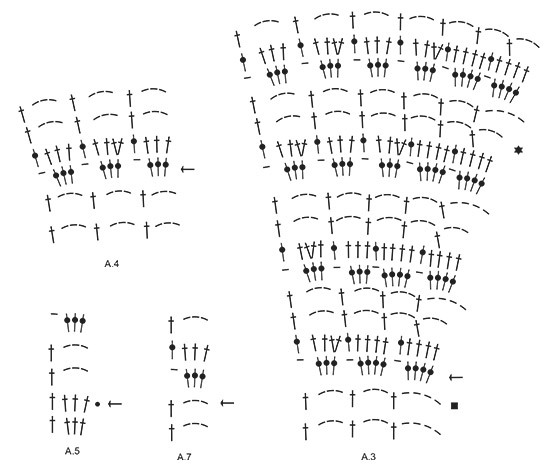 Now work from round 2 in diagram A.5 (a total of 16-18-20 repeats on the round), AT THE SAME TIME on the round with a black spot in the diagram, decrease 4 double crochets evenly along the round. 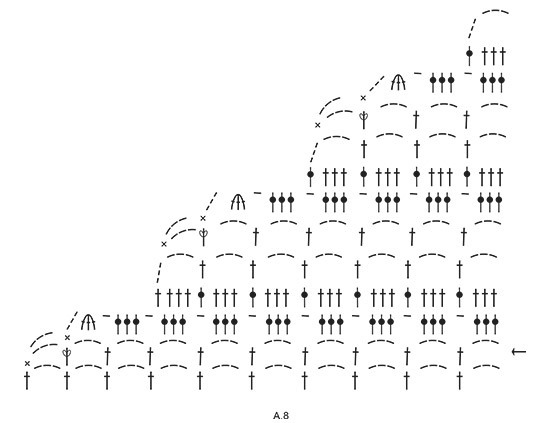 Repeat the last 4 rounds in the diagram and decrease on the round with the black spot a total of 7-8-10 times in height = 36-40-40 double crochets on the round. Then work 3-3-1 more repeats of A.5 in height without decreasing double crochets. The sleeve measures approx. 51-56-56 cm / 20"-22"-22''. Cut and fasten the strand. Work short rows back and forth on the right front piece. Start in the first double crochet after the 16th-16th-18th chain-space from the beginning of the round and work from the right side. NOTE: In diagram A.6, A.7 and A.8 you work from the row with the arrow and in diagram A.3 you work from the row with the black square! Work A.6 over the first 10 chain-spaces, work A.3 over 3 chain-spaces, work A.7 over the next 2-2-4 chain-spaces (= 2-2-4 repeats), work A.3 over the next 3 chain-spaces, work A.8 over the next 10 chain-spaces. Continue in this way, back and forth. 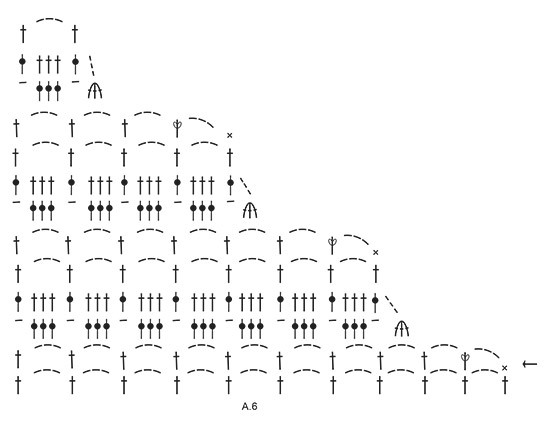 When A.7 has been completed in height, repeat the last 4 rows in the diagram in height. When A.6 and A.8 have been completed in height and the row with the star in diagram A.3 has been completed, cut and fasten the strand. Skip 29-29-34 chain-spaces along the bottom edge of the jacket and fasten the strand with 1 single crochet in the next double crochet. Then work the left front piece in the same way as the right front piece. 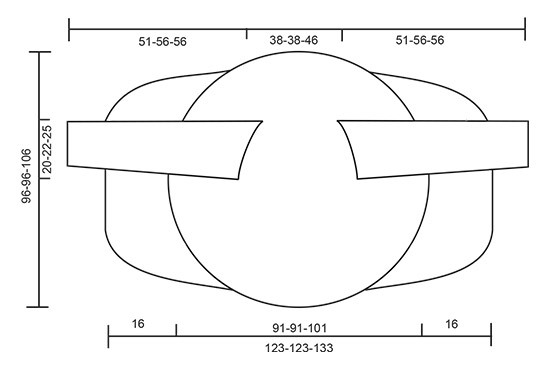 There should be 29-29-34 chain-spaces between the front pieces along the bottom edge and 32-32-36 chain-spaces between the front pieces on the neck (= 16-16-18 chain-spaces on each side of the start of the round). ROUND 1: Start at the beginning of the round (= at back of neck), work 3 chain stitches (= 1 double crochet), * 3 chain stitches, skip 3 chain stitches, 1 double crochet in the next double crochet *, repeat from *-* to end of round, but along the edge of diagrams A.6 and A.8 skip approx. 2 cm / 3/4''. 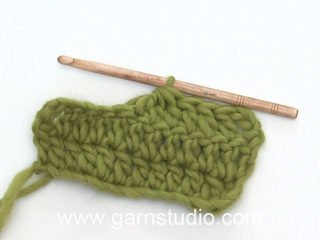 Finish the round with 1 slip stitch in the 3rd chain stitch at the beginning of the round. ROUND 2: Work 3 chain stitches (= 1 double crochet), * work 4 double crochets around the next chain-space, 1 chain stitch *, repeat from *-* to end of round. Finish with 1 slip stitch in the 3rd chain stitch at the beginning of the round. = work 6 chain stitches and form them into a ring with 1 slip stitch in the first chain stitch. = start on this round! = when this round has been completed, the circle in sizes S/M and L is finished - see description in text. = on this round decrease double crochets evenly spaced - see description in text. = work 3 double crochets together as follows: Work 1 double crochet but wait with the last yarn over and pull through, work 2 more double crochets in the same way, but when working the last pull-through, pull the strand through all the loops on the hook.